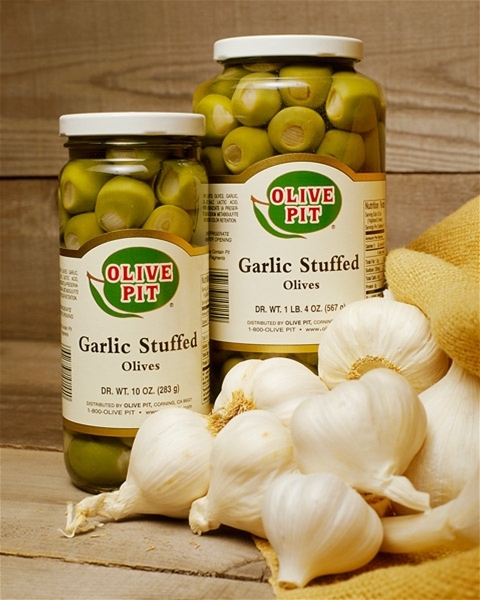 Each queen green olive is hand stuffed with a garlic clove to provide enough garlic in every bite to satisfy even the most discriminating garlic lover’s craving. Serving Suggestion: Try our "Chunky Tomato Sauce with Green Olives" recipe for a memorable dish. Bought a half gallon of them and man, I have never tasted such good olives in my life. on 1/30/2016 I love these olives! My husband has had to make several trips through Corning over the last few weeks and the last time he came back, he told me to look up "Corning Olives" and I found this website. i found it difficult to narrow down my choices to just a couple of items but I didn't want to overwhelm the hubby so I chose these plus the smoked pitted olives. These are so good! I love the little bit of crunch that the garlic adds to the olive - and I also like that the garlic doesn't overpower the olive. A really nice balance of garlic and olive. I could eat these all day - and now I'm wishing I had him get more than one jar of them! I love, love, love, olives. My wonderful brother in law stopped on the way up from Calif. What a treat. The garlic is crunchy. The taste of the garlic is mild and blends so well with the vinegar. They didn't leave an after taste either. I'm gonna order a gift box for the future. I used to stop by myself but don't travel so much anymore but neighbors do (Bless them) I love these olives and my order gets bigger every year. Got the family hooked. Thanks Olive Pit and the people who work there. Great product, really enjoy the taste, as well as use in salads, cooking, and by themselves.